“Have been extremely pleased with my entire experience with AV Innovations. From working together to determine my AV needs during my remodel, the seamless execution during installation, and the constant availability to troubleshoot post installation were top notch. The staff is respectful, courteous and best of all takes time to make sure that everyone understands what they installed and how to operate it. When we initiated a new project at our house, told our general contractor that we wouldn't be using his preferred Audio Visual company and that if he wanted my business he would have to use AV Innovations on my project and suggested he make them his new preferred provider. "I set out to find a dependable and reasonably priced outfit to handle the electronics and home automation for my newly-built lake home. I was never so fortunate as to hire Jeff Halloran and his team at Audio Video Innovations to handle the job. My plans included numerous t.v. screens, inside and out, sharing of video sources, multi-zone music, and home automation for HVAC, security and remote webcam monitoring. The plan was ambitious and required a great deal of creative thinking and logistical coordination with electricians, carpenters and other trades. The AVI team performed beautifully and on budget, and the results were fantastic. Since that time almost nine years ago I’ve repeatedly called on the AVI team to maintain and upgrade the system to incorporate the latest technology. In every instance AVI provides prompt and dependable service at a reasonable price. Over the years I’ve referred numerous friends and family members to AVI for audio-visual and home automation services. I’ve never heard a negative word about AVI from anyone of them, and they remain loyal AVI customers. Without any reservation, I give AVI my highest recommendation." Theater Under the Stars won the 2016 ARC Award for "Best Media Room". 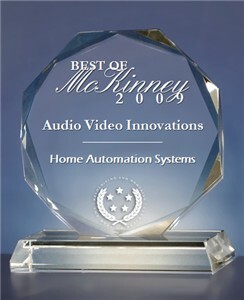 Audio Video Innovations was selected for the 2009 Best of McKinney Award in the Home Automation Systems category by the U.S. Commerce Association (USCA). Audio Video Innovations is proud of our association with the following companies.